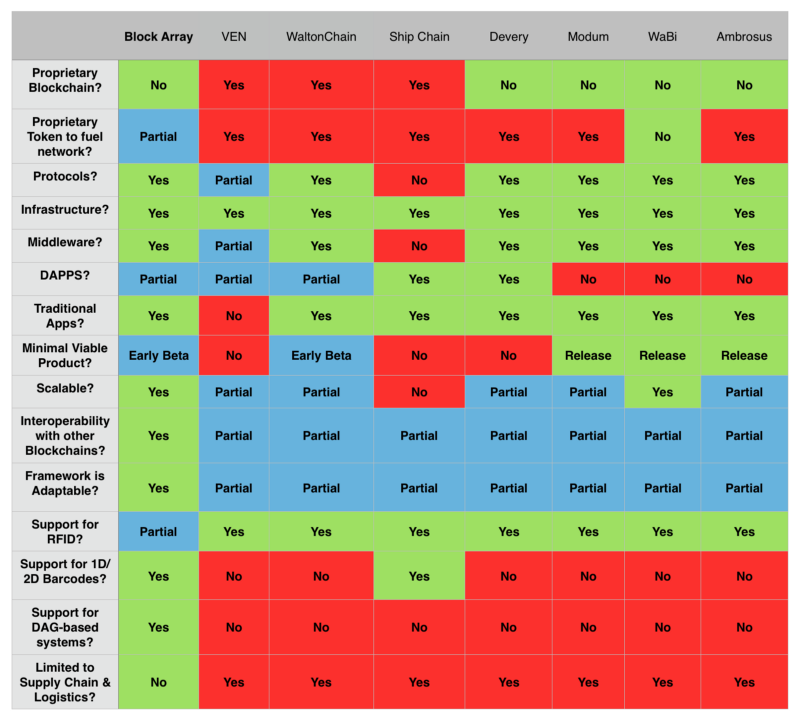 A lot of people ask us, “What makes Block Array different?”. Well, a lot of things. If you want technical break downs, we have those specifics coming out in our 7-part series, but here is a quick table of some names we hear ourselves being compared to. Mind you, we are not limited to just the logistics and supply chain industry, but that is our focus for right now. Proprietary Blockchain: A blockchain that is in-house made, and has not been tested in the real world for at least a year. Infrastructure? Corresponding Servers for accessing their network, and associated networks. Scalable? Is their offering dependent on the blockchain they are based on in order to be scalable? Interoperability with other Blockchains? Can their framework for how they integrate services and their offerings be adapted easily with any blockchain? Framework is Adaptable? Does the way their system depend on a unique property of the blockchain they are on? Support for RFID? Does the platform depend or rely on RFID? Support for 1D/2D Barcodes? Does the platform enable regular barcodes be used in their system, e.g. for product authentication, information, etc? Support for DAG-based systems? Have they mentioned or are they planning on offering any of their services on a DAG-based system such as IOTA? Limited to just Supply Chain & Logistics? Taken as a whole, are they limited to specific use cases? This is taking everything as a whole-including any mention of other industries, such as health care. Corrections & Additions: Added VeChain and WaltonChain. Unable to find WaltonChain whitepaper, so it is done from memory. Expanded some definitions to make comparisons more inclusive of potential. Please do not use this to determine any investments, purchases or contributions to any project or business listed above. This is purely for educational purposes. Please do your own research, in fact we included links to white papers below. There are things we may not be privy to that their respective teams are working on, but have not publicly disclosed.